Lynda - Apple watchOS 4 App Development Essential Training 2017 TUTORiAL | Free eBooks Download - EBOOKEE! Posted on 2017-12-07, by everest555. There are over 2 million iOS apps available in the App Store, but less than 1% work on the Apple Watch. This underserved market is a great opportunity for Apple developers. Learn how to use your existing skills-plus the tools in Xcode 9 and watchOS 4-to create apps for Apple Watch. 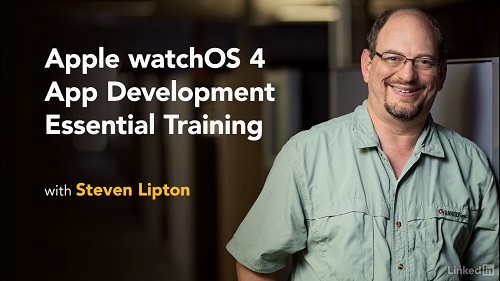 In this course, Steven Lipton shows you how to build a simple watchOS app, and then demonstrates the key differences from iOS, such as the watch picker, haptics, and the digital crown. Along the way, he shows how to create quick layouts with Interface Builder, navigate between controllers, enable dictation for text controls, and build tables. With these tips, you can quickly transition from iOS to watchOS app development and start entering the world of programming for wearable devices. No comments for "Lynda - Apple watchOS 4 App Development Essential Training 2017 TUTORiAL".